To learn more about The Way of Love, use this link. September 5, 2018 [Springfield, MA] — On October 21, 2018, The Most Reverend Michael B. Curry, Presiding Bishop and Primate of The Episcopal Church, will preach at an Episcopal revival sponsored by the Episcopal Diocese of Western Massachusetts and The Episcopal Church. The Presiding Bishop will preach at the Sunday service to be held at First United Methodist Church in Pittsfield at 1:00 pm. FUMC was selected among several sites because of location and size. Curry will travel to Worcester, later that afternoon, to preach at The Hanover Theater. 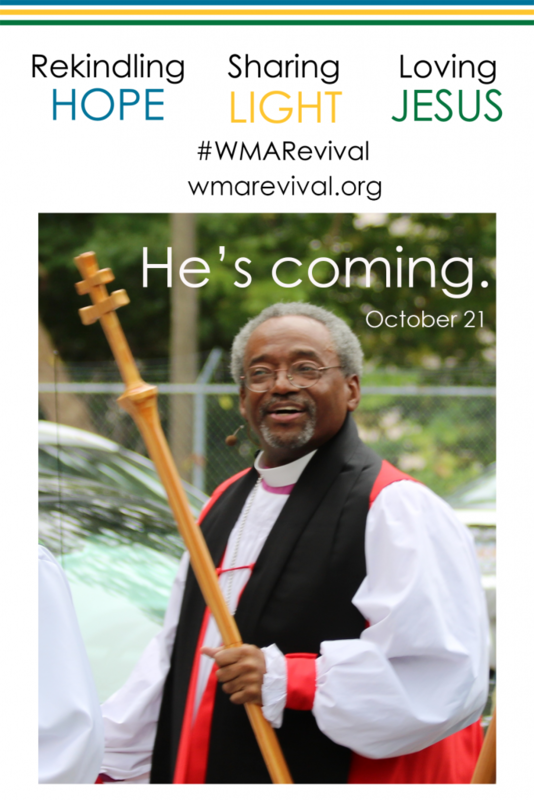 Both revival events on October 21 will be livestreamed by The Episcopal Church. Curry proclaimed to a spellbound assembly of royals, nobles and celebrities. Millions more heard the message via livestream. Revival is open to everyone. It is not just for Episcopalians. Free tickets will be available online September 17 through the revival website: wmarevival.org. Doors will open at noon. The festive service will feature the combined choirs of churches throughout the Berkshires and the Pioneer Valley.